Are you looking for the best social media plugins for your WordPress site? There are so many social media plugins available for WordPress that it becomes overwhelming for beginners to choose the best plugin. In this article, we will show you some of the best social media plugins for WordPress that you can install right away. The main problem with most social media plugins for WordPress is performance. Since these plugins have to load additional stylesheets and scripts, they often slow down your website. For more on this topic. You need to find a balance between features and performance of your WordPress site. A social media plugin with lots of features can become less useful if it’s slowing down your website and affecting user experience. Next, you need to decide which social networks will be more prominently displayed on your website. Adding fewer options can reduce clutter and offer a better user experience. Many social media plugins allow you to show social icons in sidebar, below article, before article, and so on. You need to decide how you would like to display them on your site and if the plugin supports that option. Having said that, let’s take a look at some of the best social media plugins for WordPress. EA Share Count is the fastest social media plugin on this list, and it is also the most easy to use. It comes with a limited number of the most popular social networks: Facebook, Twitter, Google+, Stumbleupon, Pinterest and LinkedIn. There are three button styles, and you can choose where to show the button (before or after the content or manually). You can also enable it for custom post types. The plugin tries to get social share count for each network. You can also choose to just show the total number of shares on all networks. 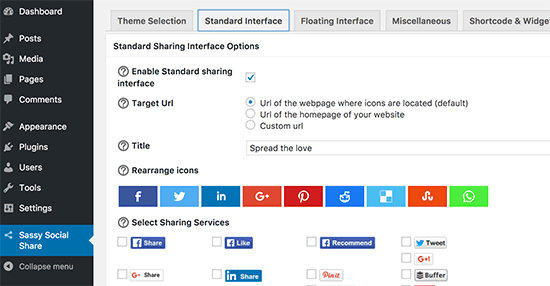 Sassy Social Share is an easy to use social media plugin for WordPress with tons of options. It comes with support for many different social media websites, and you can add buttons in post content as well as a sticky floating social menu. It supports social share count feature as well. However, like many other social media plugins, you will need to use a third party service to retrieve those stats. As for icon styles, the plugin comes with three basic styles: rounded, square, or rectangle buttons. You can set the positioning options in the plugin settings for both standard and floating social bars. 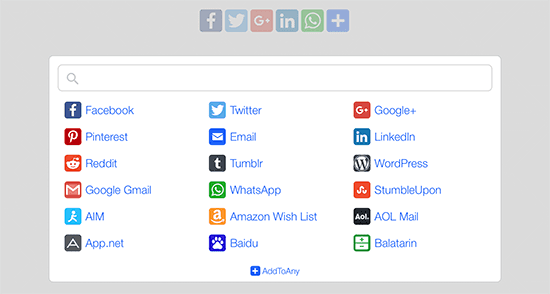 AddtoAny is a social sharing tool also available as a WordPress plugin. It offers many social media platforms, floating and standard social sharing bars, and a universal sharing menu. It can show social share count without creating an account and offers Google Analytics integration. AddtoAny has a smaller footprint on performance when compared to other similar tools that offer global social sharing buttons. Buffer is a popular social media tool that allows you to schedule your posts on Facebook, Twitter, LinkedIn, etc. WordPress to Buffer plugin allows you to automatically add new posts to your Bufferaccount so that they are shared on your social media profiles. For detailed instructions, see our guide on how to schedule WordPress posts for social media using Buffer. Like the name says, Simple Social Icons displays social media icons in a sidebar widget. You can choose colors and then enter the URLs for social media accounts you want to be displayed. It has a limited number of social media platforms covering all the most important and popular services. It is very easy to use and has minimum impact on performance. For detailed instructions, see our tutorial on how to add social media icons in your WordPress sidebar. Social Icons Widget allows you to easily add social media icons to your WordPress sidebar. It offers three icon styles: rounded borders, round, and square. You can also use custom colors for icons if you want. Upon activation, you need to visit Appearance » Widgets page and add Social Icons widget to your sidebar. Replace the default URLs with your own social media profiles or click on add more to add a new service. 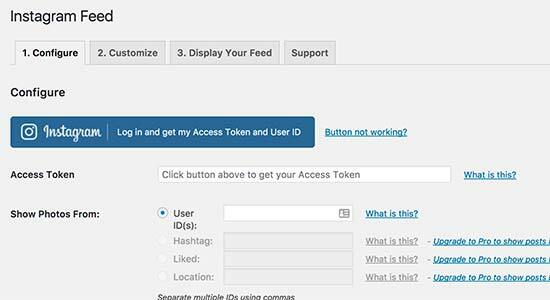 Want to allow users to register, login, and comment using their social media accounts? 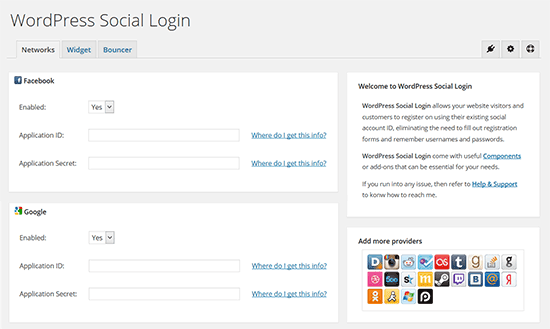 WordPress Social Login allows you to do just that. It is super easy to use and supports a wide range of social networks. It also includes modules to show user insights, user manager, contact manager, and a BuddyPress component. To build your reach and keep users engaged on social media, you need to post more regularly on all those accounts. This can take a lot of your time. 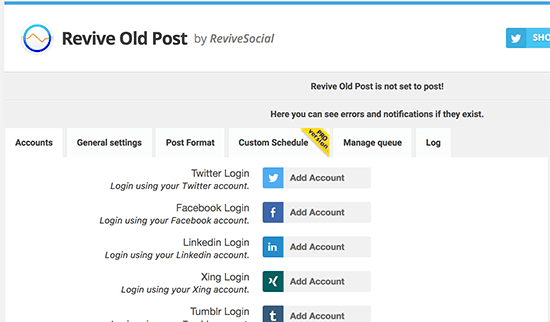 Revive Old Post plugin allows you to automatically share old posts to your social media accounts. This allows you to keep your social media accounts active. It also offers your users a chance to engage and discover popular content from your site. For detailed instructions, see our guide on how to automatically share your old WordPress posts. Want to display your Instagram photos in WordPress? Instagram Feed allows you to beautifully display your recent Instagram photos in WordPress. You will need to generate an Instagram access token. 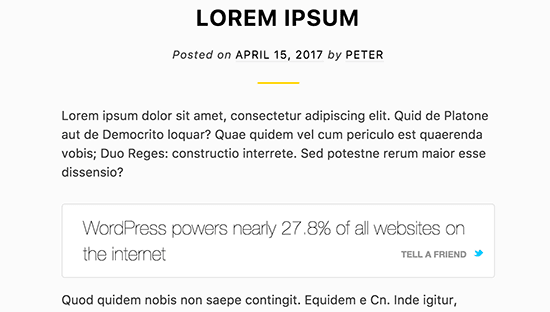 After that you can use the available shortcodes to display the feed anywhere on your site including posts, pages, or sidebar widgets. It also allows you to create multiple feeds by customizing shortcode parameters. You can even fetch multiple Instagram accounts to create a single feed. You may have seen customized quote boxes on many popular blogs that allow users to easily share the quote on Twitter. Better Click to Tweet plugin allows you to add the similar click to tweet quote boxes to your WordPress posts. For detailed instructions see our article on how to add click to how to add click to tweet boxes in your WordPress posts. We hope this article helped you find the best social media plugin for your WordPress site. You may also want to see our ultimate step by step WordPress SEO guide for beginners.